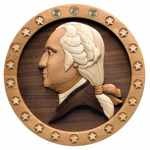 This 16 inch diameter plaque features a likeness of George Washington in the center and a band around the edge, drilled to accommodate the first twenty-two presidential commemorative gold coins. The 28 series (plans that start with 28-) are the best of the projects from Editors of Woodcraft Magazine. Plans feature step by step instructions with photographs, some include exploded illustrations for various project steps, a cut list and cutting diagram, and a Convenience Plus Buying Guide so you know exactly what supplies are required to complete the project. Zoo Animal Coin Bank Woodworking Plan Set. Children love zoo animals and they will love these coin banks that feature a zebra, an elephant and a giraffe. Plan includes FULL SIZE patterns for all three banks. Sea Creature Coin Bank Woodworking Plan Set. Three popular sea creatures: a Dolphin, a Killer Whale and a Walrus. Plan includes FULL SIZE patterns for all three banks. Banks measure from 8-3/4 to 11-1/2 inches high. Teach kids to save money. A friendly bear surrounds this gallon plastic jar. Easy project to make from 3/4 inch pine. Teach kids to save money. A friendly pig surrounds this gallon plastic jar. Easy project to make from 3/4 inch pine. Patterns drawn FULL SIZE. Baby Pet Coin Banks Woodworking Plan Set. This coin bank set includes three animals - A turtle, bunny and duck. Plan includes full size patterns for all three projects. Largest bank is 9 inches high. Baby Bear Coin Banks Woodworking Plan. Puppy Coin Banks Woodworking Plan. These adorable puppies make saving fun for everyone not only children! Easy to build from 3/4 inch lumber. All patterns drawn FULL size. Inspire your kids or grandkids to save for a rainy day! This coin bank has clear side plates that allow you to see Noah and his animals as coins fill up inside the ark.